Data integration can no longer be an afterthought – it's a key component of data governance. 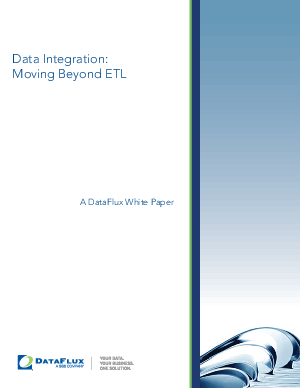 Yet traditional methods of data integration like Extract, Transform and Load (ETL) may no longer be the optimal choice for every business. Enterprise organizations have several options for data integration processes and solutions, from integration methods (consolidation, propagation and federation) to web-based and software-as-a-service models. This white paper explores the various methods of data integration that can help an organization find a solution that fits its specific business needs.